MainAll NewsInside IsraelCould Netanyahu form alliance with Bennett? Could Netanyahu form alliance with Bennett? Prime Minister reportedly seeking to form joint list of Likud and the New Right for this year's election, to counter Benny Gantz. 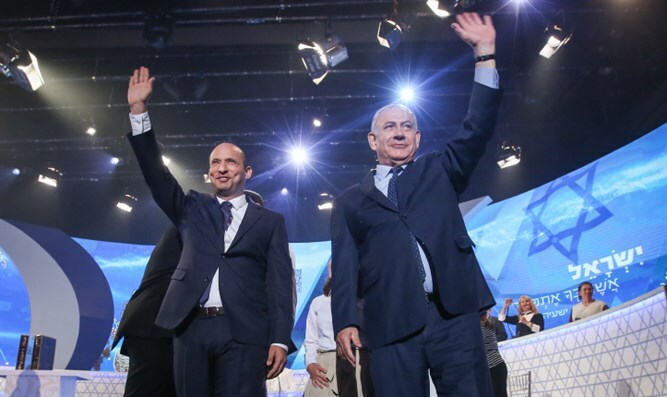 Despite the bad blood between the two for over a decade, Prime Minister Netanyahu is considering running together with Naftali Bennett's New Right in the upcoming elections. According to the Kan report, Netanyahu is debating a union with the New Right as a response to former IDF Chief of Staff Benny Gantz's recent surge in the polls and speculation that Gantz could run together with Yesh Atid. Netanyahu and Bennett have had an adversarial relationship dating back to the time when Bennett and Shaked served as key Netanyahu aides before leaving under acrimonious circumstances in 2008. Ever since, Netanyahu and Bennett have had a frosty relationship. In addition, recent reports exposed the lengths which Netanyahu went to in order to engineer negative anti-Bennett press coverage on the Walla news site. In December, Hadashot reported that Netanyahu had asked Walla owner Saul Elovitch to publish stories detailing that Bennett's wife Gilat worked as a chef in a non-kosher restaurant. An infuriated Bennett later tweeted that Netanyahu had committed "a despicable and cowardly act". Earlier this month, Hadashot revealed that Netanyahu had attempted to besmirch Bennett by defaming his father Jim. The prime minister reportedly instructed Walla through an intermediary to publish that Jim Bennett had attempted to harm Prime Minister Yitzhak Rabin in the wake of the Oslo Accords.